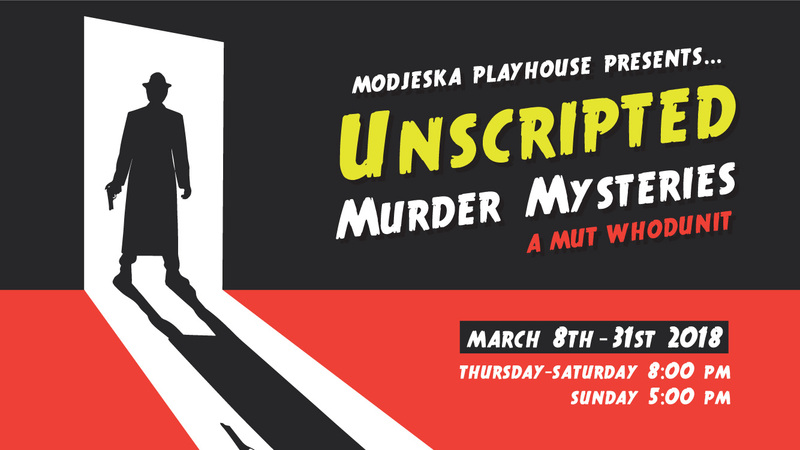 Modjeska Unscripted Theater is back with an all new production, Unscripted Murder Mysteries! In the style of Agatha Christie and other great mystery writers, the MUT cast will create 15 completely improvised plays with so many plot twists and laughs not even the cast will know who the killer is until the end! Come spend a fun-filled evening of laughs, mystery, and farcical antics while trying to figure out WHODUNIT! Unscripted Murder Mysteries opens Friday, March 9 at 8 p.m., followed by an opening reception. There’s a discounted $20 Preview Night on Thursday, March 8 at 8 p.m.
Thurs – Sat at 8 p.m.
Sunday Matinees at 5 p.m.
$20 Preview Night: Thurs, March 8 at 8 p.m. Opening Night w/reception: March 9 at 8 p.m.